Warriors guard Stephen Curry scored 40 points and broke one of Ray Allen's records in a 114-97 win over the Heat in Miami. Warriors guard Stephen Curry went off for a season-high 40 points in a 114-97 win over the Heat in Miami on Tuesday. Curry passed sharpshooting legend Ray Allen for the most games (51) with at least five three-point field goals and five assists, according to the Elias Sports Bureau. Keep in mind, Curry is 26 and in his sixth NBA season, while Allen is 39 and has logged 18 seasons in the league. 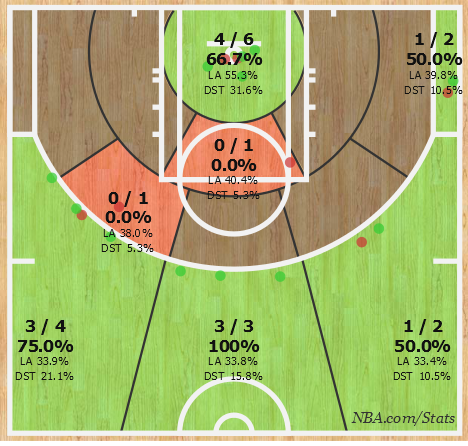 Curry hit eight of his 11 three-point attempts and finished 12-for-19 from the field in 37 minutes. He added seven assists, six rebounds and three steals. Miami forward Chris Bosh countered with 26 points and nine rebounds, but the Heat faded after taking a two-point lead with less than seven minutes remaining in the fourth quarter. Curry's three-point field goals were split evenly between the first and second half. His highest scoring quarter was the third (12 points). Of Curry's 12 made field goals, 75 percent were unassisted and 63.6 percent came without a defender within 3.5 feet of him, according to NBA.com. After the game, Miami coach Erik Spoelstra was asked about how his team defended the Warriors' star. "That's the fastest release I've ever seen," Spoelstra said, according to Diamond Leung of the Bay Area News Group. "You try to do as much as you can."